The first and only woman to hold the position of U.S. Secretary of Energy, Hazel Rollins Reid was born May 17, 1937 in Newport News, Virginia. During this time of public school segregation, Reid’s parents, hoping for better schooling opportunities, sent their daughter to live with an aunt in New Jersey. There Reid attended a school for artistically gifted students. Reid entered Fisk University in Nashville, Tennessee in 1955 and graduated with honors four years later. She was elected to Phi Beta Kappa National Honor Society at Fisk. Seven years later she received a law degree from Rutgers University and soon became an attorney in the New Jersey State Attorney General’s Office. By the early 1970s Reid moved to Washington, D.C., where she became a partner at Coopers and Lybrand, an accounting firm. Soon she joined the Gerald Ford Administration as general counsel to the Community Services Administration which administered most of the federal government’s anti-poverty programs. President Ford later appointed Reid director of the Federal Energy Administration’s Office of Consumer Affairs. In this position she became well known as a representative of the concerns of consumers who challenged the power and influence of the major energy producers. In 1977, President Jimmy Carter appointed Reid to head the Department of Energy’s Economic Regulatory Administration. Her agency included more than 2,000 employees who enforced price controls on numerous forms of energy. At this time she successfully lobbied Congress to pass the Fuel Use Act, which decreased the demand for natural gas and developed conservation programs that assisted low-income residents. While working for the Carter Administration, Reid met her future husband, John F. O’Leary, who was at the time the nation’s deputy energy secretary. The two married in 1980 and together left the department to establish and manage their own energy-consulting firm, O’Leary Associates. In 1989, following the death of her husband, Hazel O’Leary went to work for Northern State Power Company, a Minnesota utility, as executive vice president for environmental and public affairs and then president of its natural gas division. In 1992 President-elect Bill Clinton announced that he would nominate O’Leary to be Secretary of the U.S. Department of Energy. She would become the second woman and third African American nominated to the Clinton Cabinet. 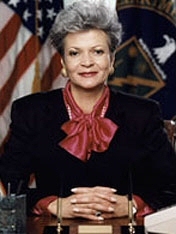 On January 22, 1993, Hazel Rollins Reid O’Leary became the seventh U.S. Secretary of Energy. She would direct the 20,000 employees of the agency and be the principal architect of the Clinton energy policy which emphasized both conservation and innovation. While in office O’Leary led the effort to find safer ways to dispose of atomic waste. She gained Congressional approval to convert one of three national nuclear weapons design laboratories into a research facility to study technologically advanced environmental cleanup practices. O’Leary also opposed increases in energy taxes. Since 2002, Hazel O’Leary has served as President of Fisk University, her alma mater. She remains an avid supporter of environmentalism. She works with a variety of non-profit organizations including the World Wildlife Fund, Morehouse College and The Andrew Young Center of International Development. United States, Congress, Senate, Committee of Energy and Natural Resource Hazel R. O’Leary nomination: hearing before the Committee on Energy and Natural Resources, Unites States Senate, One Hundred Third Congress, first session, on the nomination of Hazel R. O’Leary, to be Secretary, Department of Energy, January 19,1993 (Washington: U.S. G.P.O, Supt. Of Docs., Congressional Sales Office, 1993); Mary Anne Borrelli, The President’s Cabinet: Gender, Power, and Representation (Boulder, Colorado: L. Rienner Publishers, 2002); http://www.dom.com. Secretary, Department of Energy, January 19,1993 (Washington: U.S.
(Boulder, Colorado: L. Rienner Publishers, 2002); http://www.dom.com.